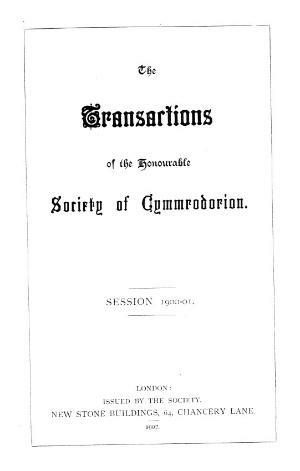 Trafodion Anrhydeddus Gymdeithas y Cymmrodorion (Transactions of the Honourable Society of Cymmrodorion) was published annually from 1893 (Vol. I) and contains historical and literary essays and reviews. The publication also includes society notes. For digitisation, the publication has been split into two sequences: Vol. 1 (1892-1893) – Vol. 8 (1899-1900) and Vol. 9 (1900-1901)-present.